Detail of the memorial to 457th BG(H) inside All Saint's church, Conington. Memorial to 457th BG(H) inside All Saint's church, Conington. Memorial to the 457th Bombardment Group (Heavy) in the grounds of All Saint's church, Conington. 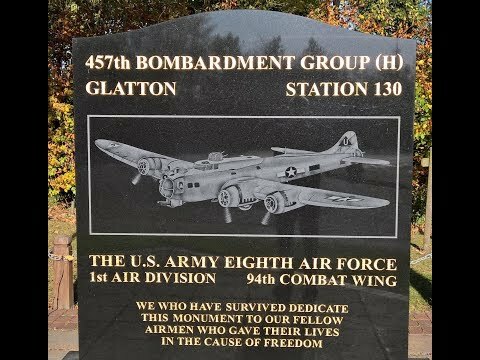 Video of the memorials to the service of the 457th Bombardment Group (Heavy) at Glatton airfield, Station 130. It includes the memorials at three sites. The church is the site of two memorials to the 457th Bombardment Group (Heavy) based at Glatton, Station 130. There is a stone memorial in the churchyard, and a Roll of Honour inside the church. The memorials are signposted on two signs in the village of Conington. Visited by Rob Edwards in January 2018. Photographs to follow.